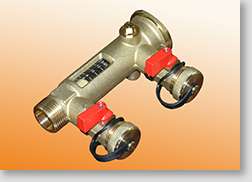 The ModvlvS programme offers a wide range of flowmeters: all items are flowmeters and flowregulators. Mainly esigned for solar systems, they are also generally used for heating systems, hydronic, geothermal energy, etc. Thanks to the available variety of sizes and connections, this product range satisfy the more complicated requirements, too (connection by capillary welding and specific models for North American market). 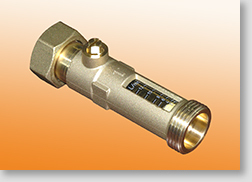 The regulation is made by a ball valve built in the flowmeter's body; on the graduated scale the slider shows immediately the flow variation. All the used gaskets are glycol-resistant. The maximum working pressure is 120 °C, but for a short period, temperatures until 160 °C are tolerated.